The Medieval Warm Period (MWP) was a time of increased warmth that is recorded in the history of the North Atlantic region from about 800 AD to 1300 AD. During this period, the extent of the Arctic ice cap was considerably less than today. The purpose of this blog is not to deny the reality of the MWP nor to reject the historical facts associated with it. However, global warming denialists have claimed that because the ice sheets of the Arctic were less extensive than today, the MWP must have been warmer than today and thus there is no reason to think that the current warming period, thought to be caused by man-made greenhouse gases, is in any way unusual. Indeed, they even claim that the readings from scientists indicating that the temperatures of the MWP were lower than today were faked in an effort to deny or cover up the MWP. Thus, I feel it necessary to demonstrate the absurdity of such assumptions. Let us do an experiment. We take two identical bowls filled with pure water and place them in a freezer. After the water is completely frozen in both bowls, they are removed from the freezer and one, labled “A”, is placed in a refrigerator, while the other, labled “B” is placed on the kitchen table. After about an hour, bowl B has ice that is PARTLY melted. We take a picture of the bowl and then discard it. A week later, we remove bowl A from the refrigerator. By then, the ice of this bowl is COMPLETELY melted. We take a picture of this bowl and discard it also. Finally, we present both pictures to someone who knows nothing about the experiment and ask him, “Which bowl would you say looks warmer to you?” He will certainly say, “A”, but he will be wrong, because bowl A was in near freezing temperature for a week before its picture was taken, while bowl B was in room temperature for an hour before its picture was taken. The point of the experiment is that it is not merely temperature that is the factor in melting water, but TIME as well. The Medieval Warm Period was indeed a natural event, and thus its arrival was gradual and so was its ending. 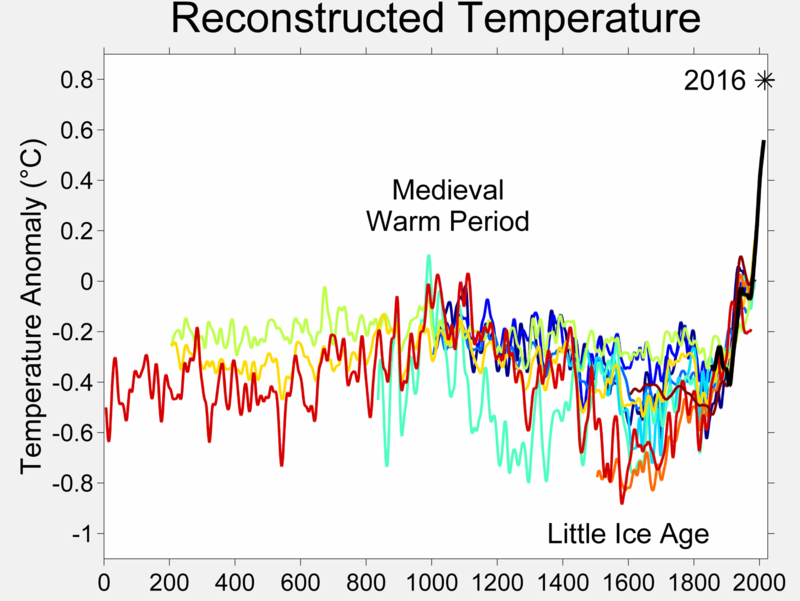 The ice sheets in the Medieval Warm Period were less extensive because it lasted for several centuries, unlike the current warming period, which has lasted for only a few decades. Thus, the picture of bowl A could represent the Arctic ice cap at the height of the MWP, while the pic of bowl B could represent the Arctic ice cap today. Higher temperatures, but less time to melt the ice cap. Thus, there is absolutely NO basis for the slanderous claims made against the scientists who have studied the progress of global warming in this present time. Indeed, if the MWP had been only three or four degrees F warmer than today’s average temperatures, we should have expected to see an almost total meltdown of both the Arctic and Antarctic ice caps, resulting in a massive rise in sea levels around the world. And history records NO such thing! This entry was posted in denialism, global warming, science, skepticism. Bookmark the permalink.